You are here: Home / Exciting events for Tiny Owl at Edinburgh Book Festival! 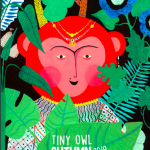 Tiny Owl is coming to Edinburgh International Book Festival! There are many events for our different books, as well as other events involving our authors and illustrators, and we are so excited for everyone to to meet and enjoy their time there! Find out all the different events and dates for them below! If one catches your eye, click the date to book your tickets. Beverley and Marjan will be bringing Cinderella of the Nile to life! Cinderella of the Nile will be having a magical event on Wednesday 22nd August! Carnegie-award winning author Beverley Naidoo and incredible illustrator Marjan Vafaeian will be bringing this ancient fairy tale to life! 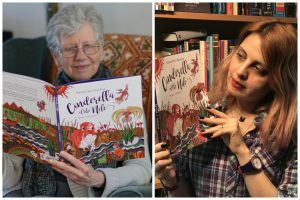 Be guided through the many different versions of the well-known classic Cinderella story, as Beverley shares how old stories can be used to create new, while Marjan creates colourful characters in her uniquely beautiful style! You can continue to learn about the enchantment of Cinderella of the Nile the next day on Thursday 23rd August at Marjan Vafaeian’s Big Draw! 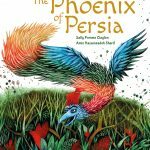 Find out all about the falcon-God Horus, and have a chance to draw your own fantastical creatures, inspired by Marjan’s gorgeous illustrations! Caged will be launching at Edinburgh International Book Festival on Friday 24th August! 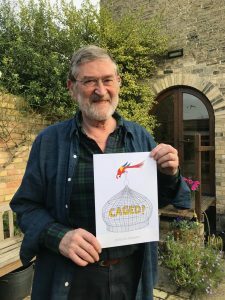 Meet brilliant creator Duncan Annand, as he shows how he made the stunning pictures in Caged. 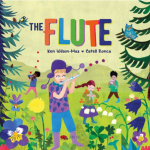 A perfect event if you love wordless picture books, find out how Duncan was able to tell a witty and wise story without using any words, and have the chance to share ideas about how to come up with a wordless tale! If you miss that event, luckily there’s another one on Saturday 25th August. There will also been an exciting Puppy Poetry event featuring the incredible award-winning poet Eloise Greenfield and this year’s illustrator in residence, Ehsan Abdollahi! 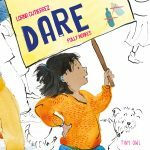 The event for Thinker: My Puppy Poet and Me on Saturday 25th August will reveal Eloise’s inspiration behind this delightful tale of friendship, while Ehsan demonstrates how he created his amazing collage illustrations. You can also have the chance to take part in making your own collage of the perfect pet with Ehsan on Sunday 26th August, where he will be having his own Big Draw event! Cut, scrunch and stick to come up with your ideal animal companion! 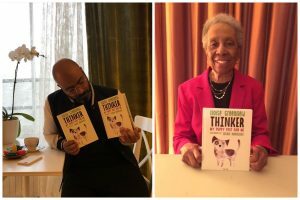 Ehsan and Eloise will be discussing Thinker together! Both Eloise and Ehsan are also involved with events that are part of Edinburgh Book Festival’s Freedom and Equality theme. Make sure you don’t miss out on seeing Eloise at her event on Sunday 26th August, for her talk with Victoria Adukwei Bulley about Civil Rights 50 Years On from the death of Martin Luther King Jr. This talk will look at culture, history, identity, and our heroes, past and present. The lovely Ehsan Abdollahi will be part of the Closing Concert, at the Freedom Finale on Monday 27th August! He will be creating beautiful freedom inspired drawings on the stage, as part of a grand finale that brings together musicians, artists and authors from around the globe! A chorus of characters, stories and sounds, that have been inspired by The Freedom Papers, which contains unique views on freedom shared by 51 authors from different parts of the world. We are so excited for all these events to take place! Ehsan Abdollahi named illustrator in residence for 2018!